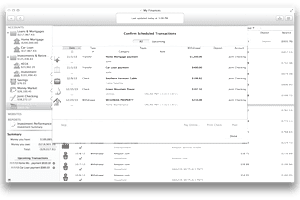 iBank 5 personal finance software for Mac changed its its name to Banktivity in 2013 and is now in its second year as Banktivity 7, which IGG Software released in September 2018. Upgrades include Tags that let you view your spending habits, Quick Reports. Workspaces, Report Groups, Find Features, and Portfolio, which monitors investments. Banktivity 7 is compatible with macOS High Sierra and also offers great display features using Dark Mode on macOS Mojave. Pay bills. The software connects via the internet to most major U.S. banks. Payments can be scheduled and sent while transactions for payments are categorized in account registers. Automatically update transactions. Use Direct Access to connect to over 10,000 banks worldwide. Direct Access is a subscription service. Manage your budget. The budget feature automatically uses scheduled transactions, provides at-a-glance daily progress updates, adjusts future budgets, and views history. Updates everything at once. You can do less manual data entry or eliminate it entirely with the "Update Everything" button. This imports all account transactions and ​updates stock and other investment prices, and syncs iOS devices. There are also iPad and iPhone apps available. Provides investment and loan support. You can import data from Quicken for Windows or Quicken Essentials and other personal finance software. "Resolve View" displays recent transaction activity. Banktivity 7 has several new features. Dark Mode for macOS improves how you view your finances; real estate tracking can link with Zillow and allows you to track your loans and mortgages; calendar tracks your past and upcoming bills and transactions; and stock lot selection tracks what stocks you have sold. In addition, Banktivity 7 improves reconciling, as transactions can be automatically included in each statement. The "Search" feature also appears more frequently, so you can filter your information. This app comes with a the 30-day, fully functional free trial, which you can get at the IGG Software website or the Mac App Store. You must pay for a license after 30 days, but, if you were using Banktivity 6, you can simply upgrade for $34.99. If you are a first-time customer, you can purchase Banktivity 7 for $69.99.